It's decidedly un-summery today, isn't it? I'm currently wrapped up in a BLANKET on the sofa as I type this and I'm actually kind of looking forward to the Autumn (dare I say). I'm also hyped for September and October in general, not least because it's the busiest couple of months in the world of interior design. All the major design shows and product launches are going on and it's always a really exciting time. I've been sifting through some press releases today and I wanted to share an upcoming collection which I love already, being launched by the ever amazing IKEA, due out this October (that's only 8 weeks away folks - whaaaat!). So here goes, I think you'll love it. THE EFTERTANKE COLLECTION is a limited edition collection by IKEA in collaboration with superbly talented makers and entrepreneurs in Thailand through a scheme called the Doi Tung Development Project. 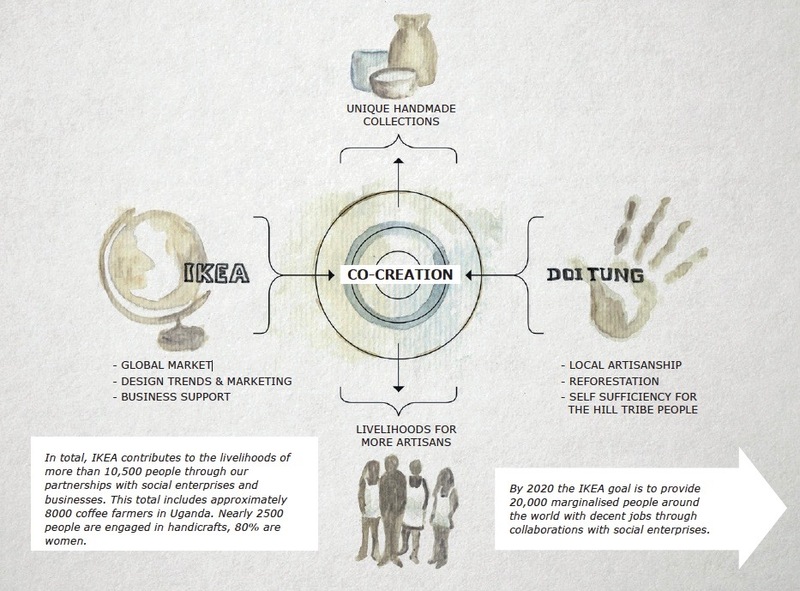 IKEA is forming these sorts of partnerships worldwide with social enterprises like Doi Tung which provide livelihoods for local people who wouldn't otherwise have access to employment, at the same time as celebrating the unique skills and ancient crafting techniques of tribesman which are expertly translated into collections for us, the IKEA customer. "The hands that made EFTERTANKE belong to the many skilled artisans of the Doi Tung Development project, a social enterprise working to provide decent jobs, schools and healthcare to an entire community"
The end result is this, a stunning collection of home accessories including hand-woven textiles, stoneware, and hand-made paper products which are BEAUTIFULLY SIMPLE, RAW and TIMELESS. True to my own style, the collection's unique imperfections and wonky lines are what makes it so appealing, and I love the story behind it. I love the simple colour ways and patterns. The textiles look super soft. With simple handcrafted pottery you can't go too wrong. AVAILABLE IN: Wembley, Lakeside, Leeds, Southampton, and Tottenham IKEA stores from October 2017. I can't wait to buy some tea towels and paper products in particular! What do you think? P.S I've just set my Autumnal Interiors Pinterest Board live to help get you in the cosy Autumnal mood (although I'm hoping we still have a bit more summer to enjoy first! ).